I've revived a number of reviews that were written over the last two years but had been orphaned as I changed the purpose and focus of another Blog. They fit here well enough, and while not cutting edge remain relevant and informative. While far from edgy or avant garde, Fetch is a remarkable little story with a number of uncommon observations lurking just beneath the surface. The story is written from the POV of one reverend Ian, the parish priest in a small Irish town. In a tone reminiscent of Flannery O’Connor, he tells his tale in an unaffected manner, while relaying the most agonizing circumstances and emotional trauma. Father Ian is approached by a parishioner fearful that a doppelganger has come to do him harm and asks Father Ian to reconsecrate an old and disused cemetery in order to insure protection. Father Ian puts the old man off but is drawn into a supernatural intrigue when he later finds the old man dead in his own easy chair. Like O’Connor Roche focuses on the observations of the POV character painting the world with the broad, surrealist strokes and sparse description that characterize human recollection, with intermittent swathes of intense detail that relate the Character’s and possibly author’s heightened emotions. It’s a good read and well worth the price of admission. When I read this novel several years ago it was awesome. The development of characters was as fascinating as the space opera romp. This time I was not impressed. What changed? A new edition. In the interest of increasing the ever shrinking bricks and mortar shelfspace and (I presume) to keep the attention of an ADD population who think Mark Twain wrote in "old English", Publisher are gutting past works and passing the readers digest version as an improvement. What was a great novel by a respected author is now a much diminished work that I'd have passed on if I'd known. Plotting suffered, characterization was flattened and in certain cases characters were simply eliminated along with entire chapters of plot development that was necessary to a smooth and coherent conclusion. I'd still recommend reading it, just find a 1st edition mass market. You'll be a lot happier. 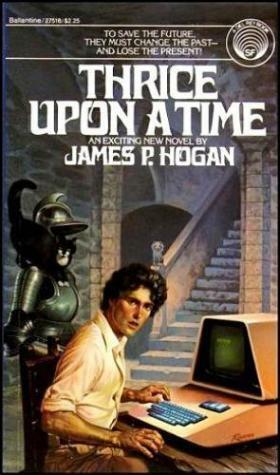 James P. Hogan's Thrice Upon a Time is a subtly dramatic view of very real people in a very unreal and, at this point, alternative reality.I read this book when it first came out and had lost my copy over the years. Rereading it with older and more jaundiced eyes, I expected to fine it dated and a bit trite. Amazingly, it has held up extremely well. My purchase was a used first edition mass market, so the text was as pristine as available, yet it read like it might have been written last year. Hogan was careful to accommodate emerging trends in popular technology and produce a surprisingly coherent and *accurate* view of life in the 21st century. By focusing on character and events rather than lengthy lectures on the underlying mytho-physica (pardon the coinage), he leads the reader to care enough to over looked the stilted narrative, produced by revisions in the timeline. While his concept of linear "universes" is a bit untenable, his realistic portrayal of scientists and engineers at work is seductive and leads one to suspend disbelief far more readily than for works that are better grounded in high energy physics and quantum mechanics. Even there however he excels at predicting the trend in theory. His "closed system" and dark energy "leakage" as tau particles is as charming as Star Trek yet not entirely dismissible as "real" science. In summary, if you haven't read it, read it. If you have read it, read it again. You'll likely find it as charming and fun as I did. I just saw Beautiful Creatures. I know this is a bit late, the movie has been out for a bit. However I am seldom in the mood to see a film, but this was an occasion. I think I've not recently seen a more offensive movie. The movie and I can only assume the book it was adapted from, begin by portraying every Christian in the south as an ignorant, bigoted, superstitious and powerless fraud. This is juxtaposed against the sophistication, arrogance, hostility and chauvinism of the Casters, which is justified in light of the fact that the Casters are a superior race with real power that must be hidden to avoid persecution. Sound like the Hale Bop Comet Cult? Yeah it kinda does, only with creepy vines and freakish weather. The entire story is designed to embitter the pagan against Bible based religions and to encourage insularity. This is a new venture intended to provide a Full Gospel believer's perspective on art, film and, in particular, literature. I've been blessed to have had the opertunity to study literary criticism and computer science at Evangel University. You may never have Heard of her but she is a school with the academic rigor to have metriculation agreements and even partner in cooperative degree program with Washington University, one of the most academically rigorous and prestigious schools you may never have heard of. Enough about my qualifications and on to the purpose. This blog, Library Secular, an oblique reference to the secular clergy of the Full Gospel movement, is intended to provide content ananlysis and creative criticism. This means that the literary quality, photography and filmation (where applicable), and moral or ethical themes will be sifted and reported as faithfully as possible. I will primarily focus on SF&F (Science Fiction and Fantasy) because this is an area that is generally panned by believers out of a knee jerk reaction to worldly content. This is, in my opinion, a mistake since most of the philosophy of the Modern and Post Modern West has been encapsulated in this sort of genre' fiction. Mark Twain speaks to the ethics of more people than the heady cerebral pennings of De Carte or Nietzhe. I have some background in fine art so we may stray there, as well as music and anything else that has an impact on popular culture, but my focus will be to equip you with the tools to approach the world of popular fiction with open eyes and sound reason, without the knee jerk reaction that ignorance can breed. If you are a believer with a desire to braoden your literary interests beyond the safe world of "Christian" literature or an industry professional seeking to reach rather than alienate the moral and ethically conservative believer, then you are my audience. What I say here may be hard. hard for readers as well as pros. But it will be reasoned and in keeping with my understanding of Biblical values. So hang on and hopefully this will be entertaining and informative and above all fun.